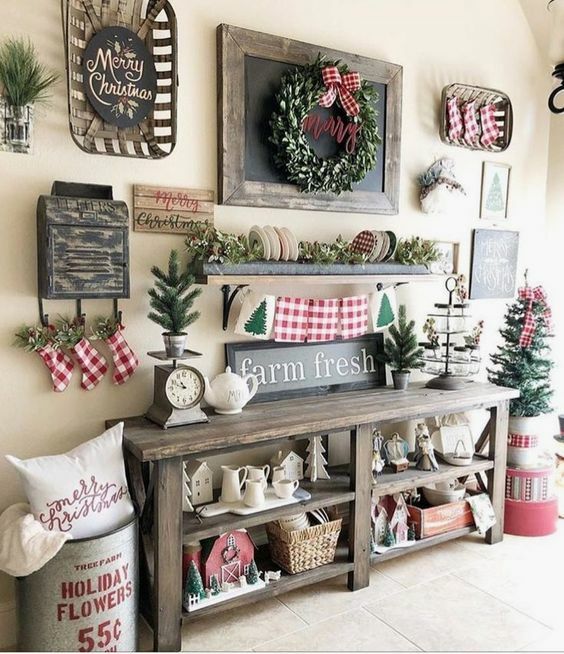 Nowadays, the farmhouse Christmas decor ideas are getting more and more popular. 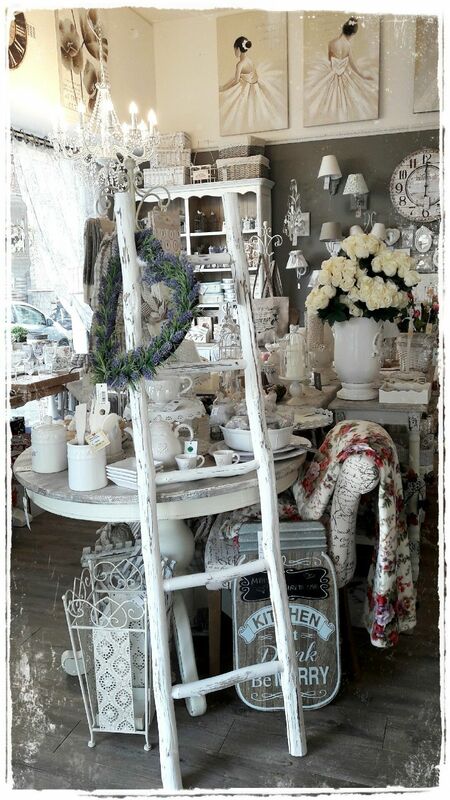 They will surely help you create wonderful Christmas decoration, from bright and lively to glam and elegant. 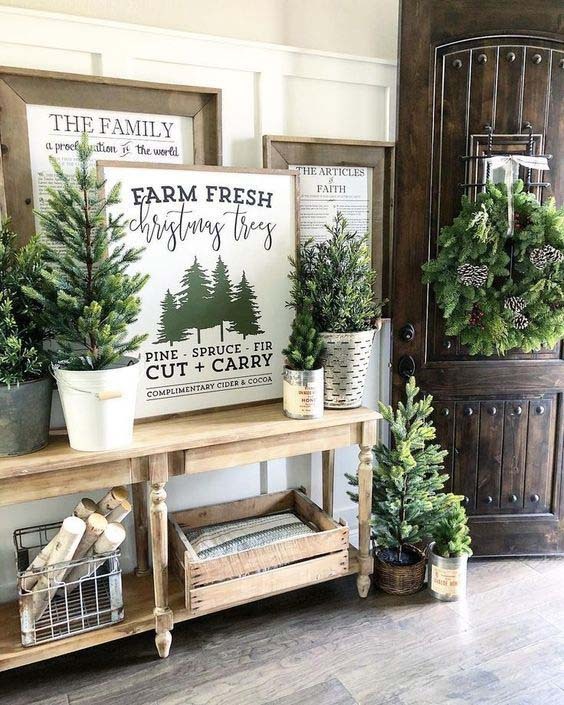 So get your home ready for the holidays with these 29 fresh farmhouse Christmas decorating ideas I have prepared for you! 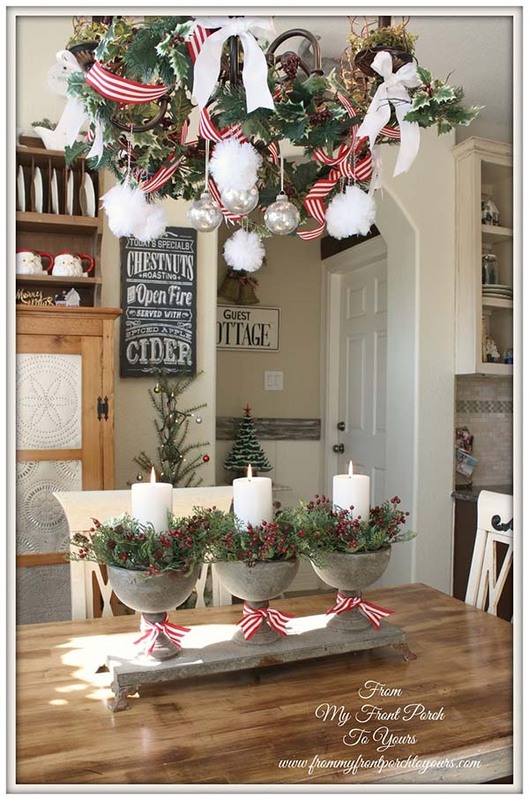 I choose to start my list of rustic Christmas decor with this lovely DIY entryway full of greenery. It certainly adds some nice touches that completely make the space! I believe that the small, almost invisible details are the ones that make a home to sparkle. 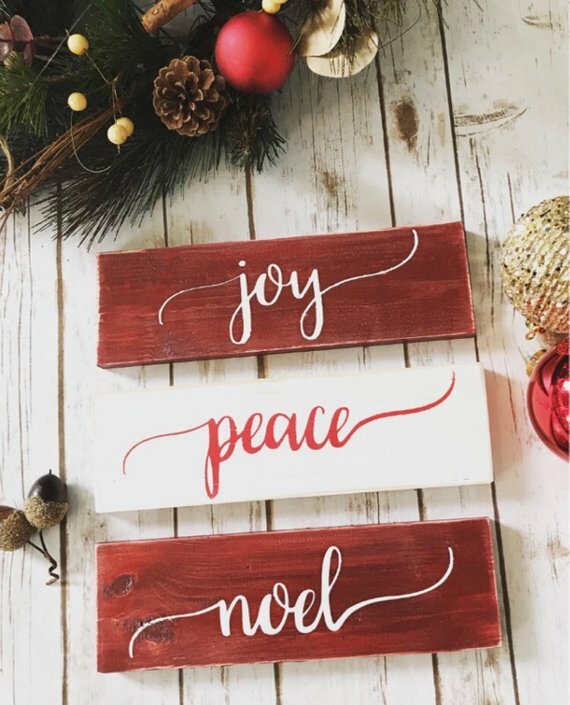 For instance, this handmade Christmas sign crafted from solid cherry wood will be a cute addition to your farmhouse Christmas decor. 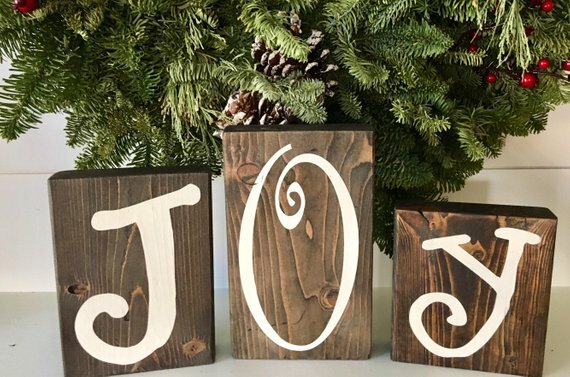 You can buy these large metal letters from Hobby Lobby and just add a strand or two of garland to make the letters look more Christmas-y. 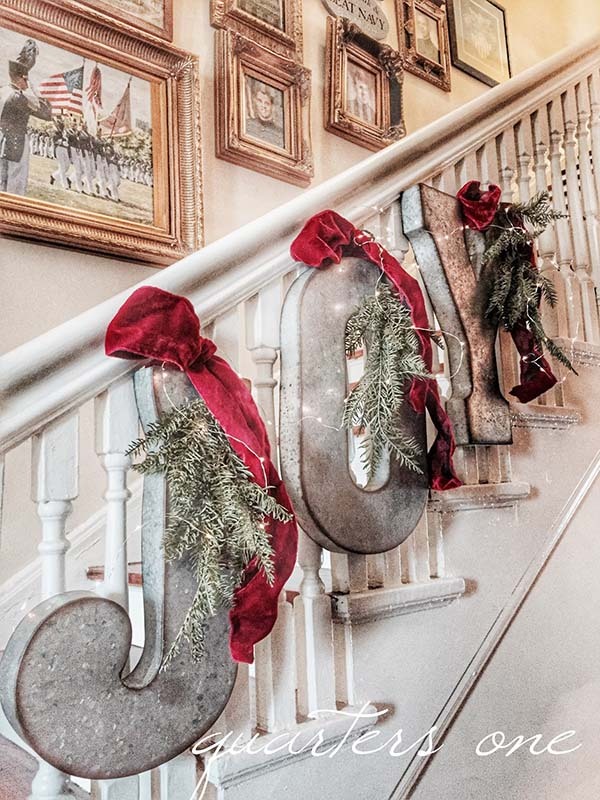 They are an eye-catching Christmas stairs decoration for the holidays. 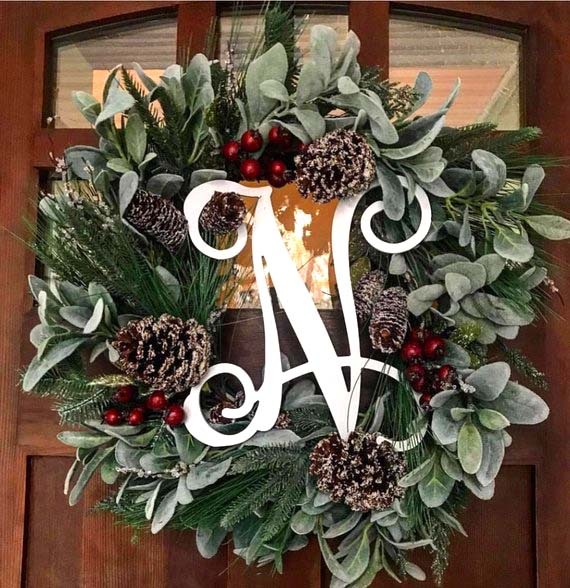 This simple, chic, and understated wreath is a timeless farmhouse Christmas decor! 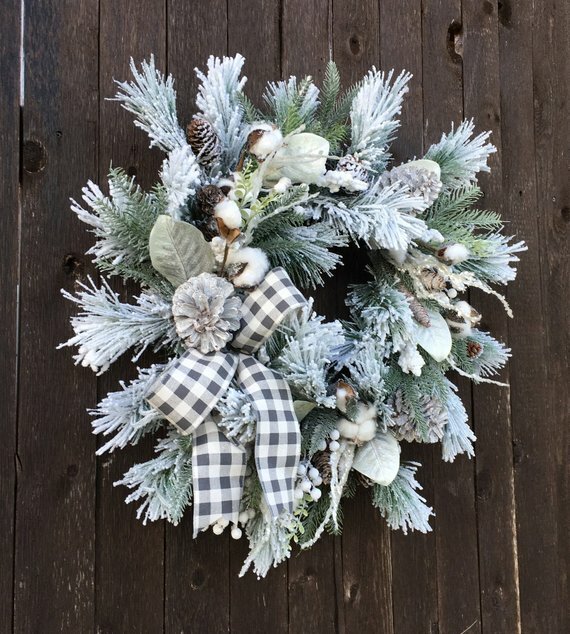 the pine branches with pine cones and red berries give the volume to this wreath. The red berry sprays and icy pine are used for a nice touch of color. My family loves drinking lots of tea and hot chocolate around the Christmas season. That’s why the idea of an old farmhouse tray makeover sounds great to me! 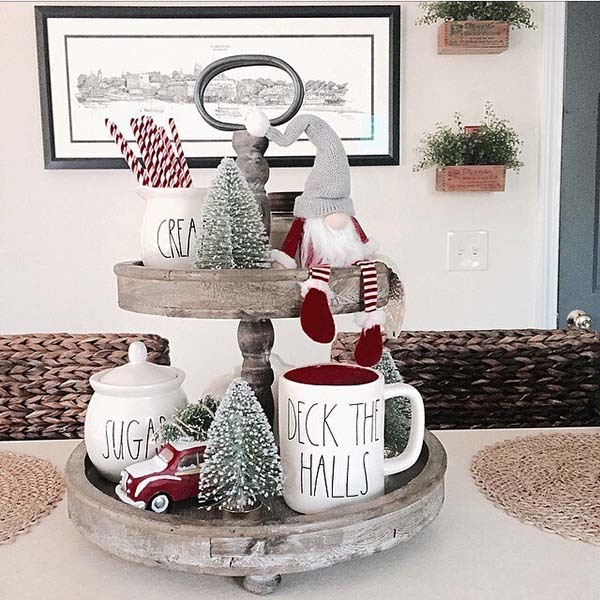 Set your imagination free and create the DIY farmhouse Christmas decor of your dreams. 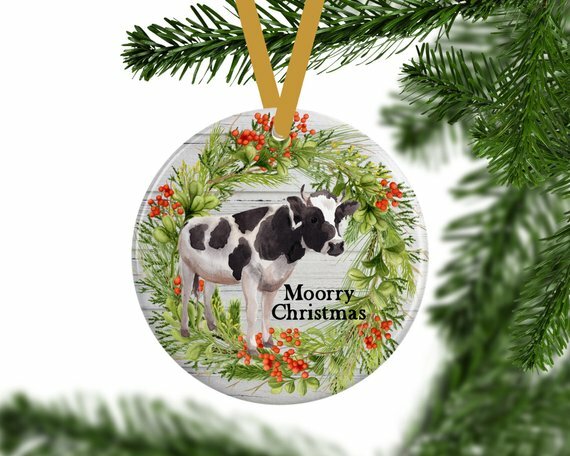 Here is a fun rustic Christmas decor, made of ceramic, with a sweet cow wishing you a “Moorry Christmas”. This could be a great gift for who’s a farmer or who’s a true animal lover. 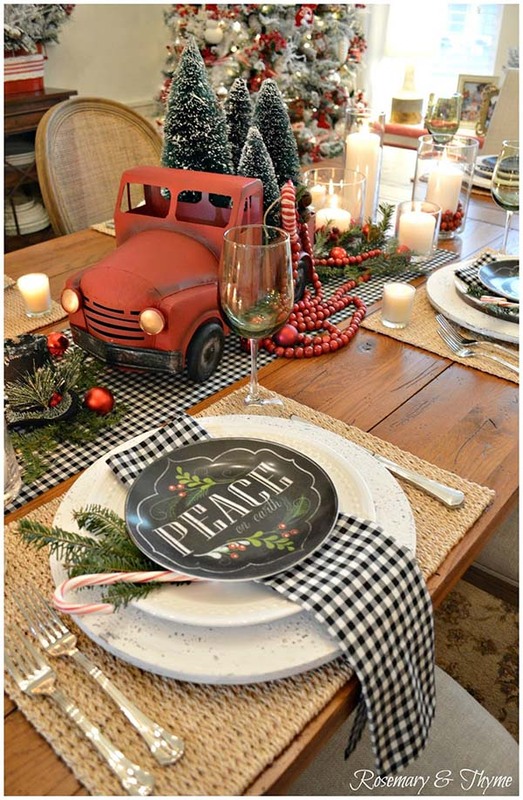 This is one of my favorite rustic Christmas table decorations due to the original centerpiece – a vintage red truck. Besides, the combination of those elements brings both cheery and classy vibe. This wreath is surely a unique rustic Christmas decorating. 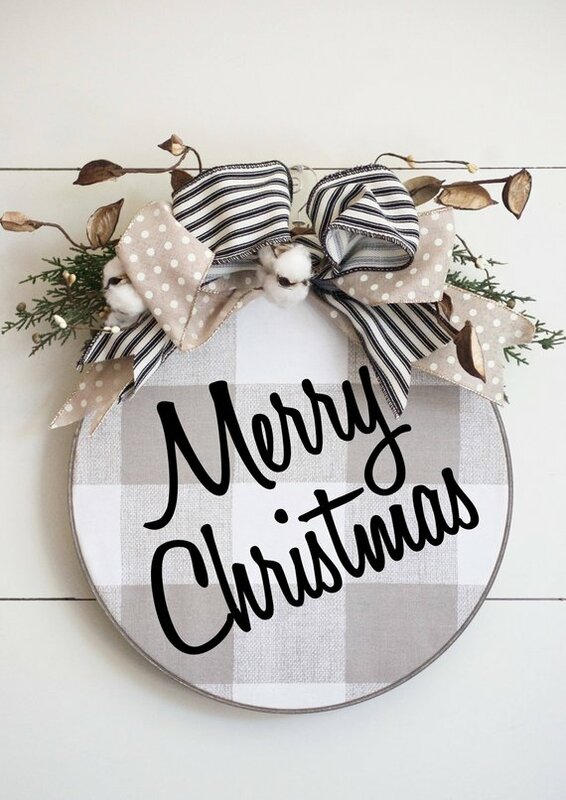 It is made of natural and cream buffalo plaid fabric with a black “Merry Christmas” sign in an embroidery hoop. If you will host the family Christmas dinner this year, you might want to steal some ideas from this picture. The candle centerpiece and the hangings decors add some volume to the entire space and make it feel more cozy and warm. 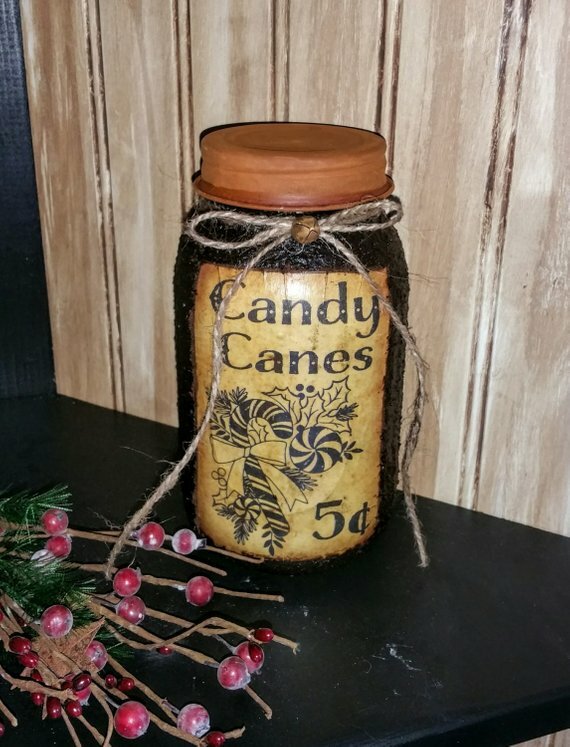 I just love this classic quart-sized Mason jar turned into a primitive accent piece for your vintage farmhouse Christmas decor. 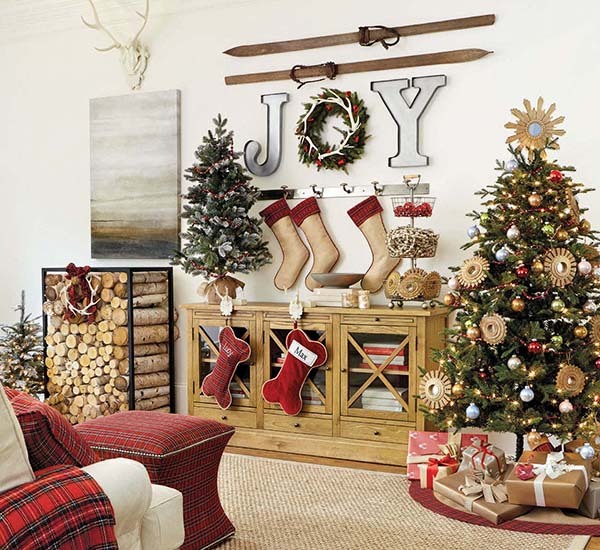 This bunch of birch logs, Christmas tree clippings, and berries will perfectly fit the foyer. Tip: Add a string of Christmas lights for extra glow. This rustic design in white embodies a classic, timeless feel. 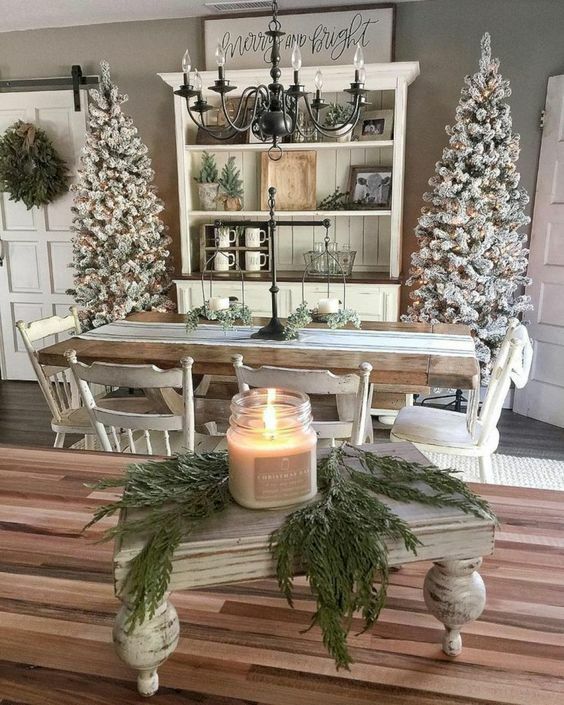 The two symmetrical Christmas trees are a bold adjustment to this vintage farmhouse Christmas decor. 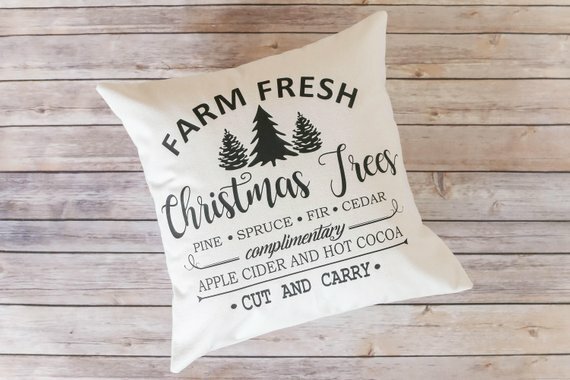 If you want to make your home cozier, why don’t you add some textiles to your farmhouse Christmas home decor? 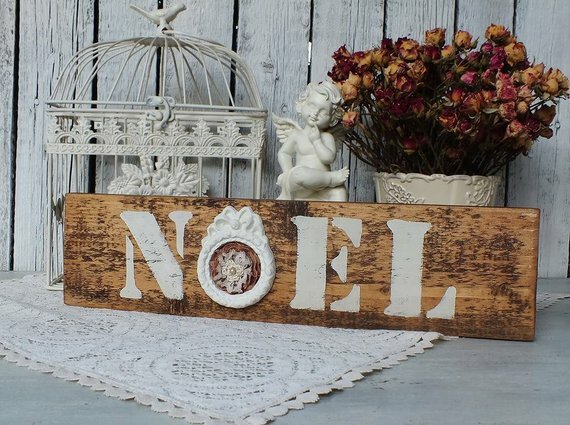 Take a few steps towards joy with this handmade vintage Christmas sign that is surely the focal point of this decor. 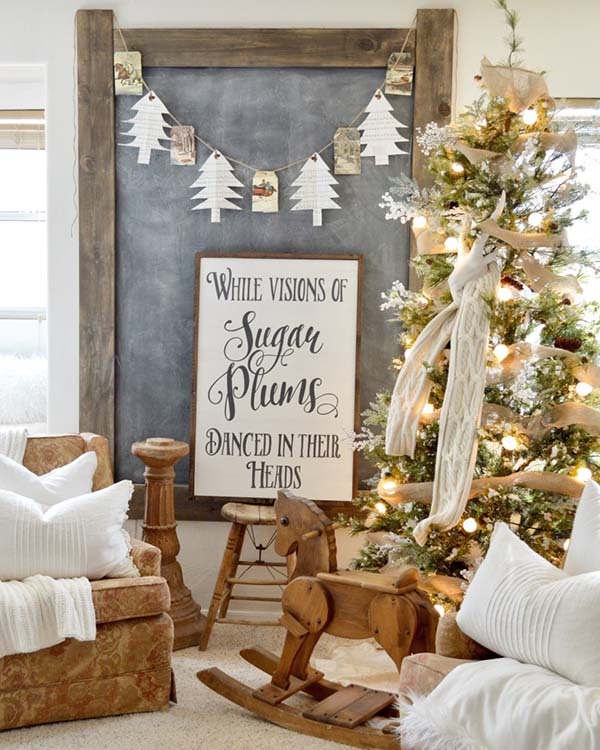 These rustic wooden signs can be the ideal farmhouse Christmas tree decorations! They will certainly add character to any space or occasion and can be displayed or hung around your house to bring a strong Christmas-y vibe. Spruce up the mantle with a bunch of textile decorative stockings in white and gold. And what about the flaring wall art above the fireplace? 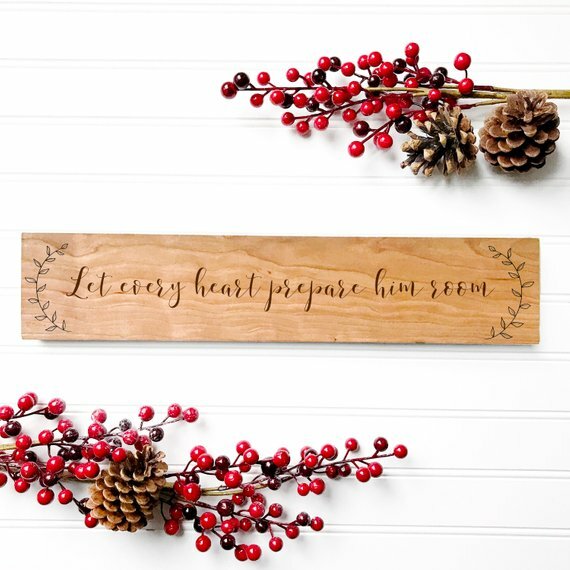 Add this to your list of rustic Christmas decorations and spread the cheer at your home as well! 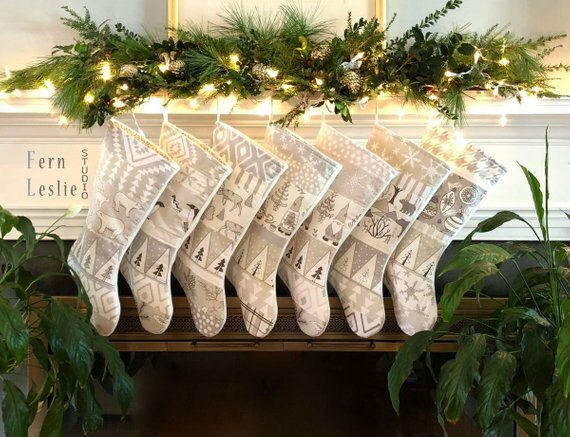 This lovely family set of 7 DIY white Christmas stockings could be a great gift for a friend or family member. 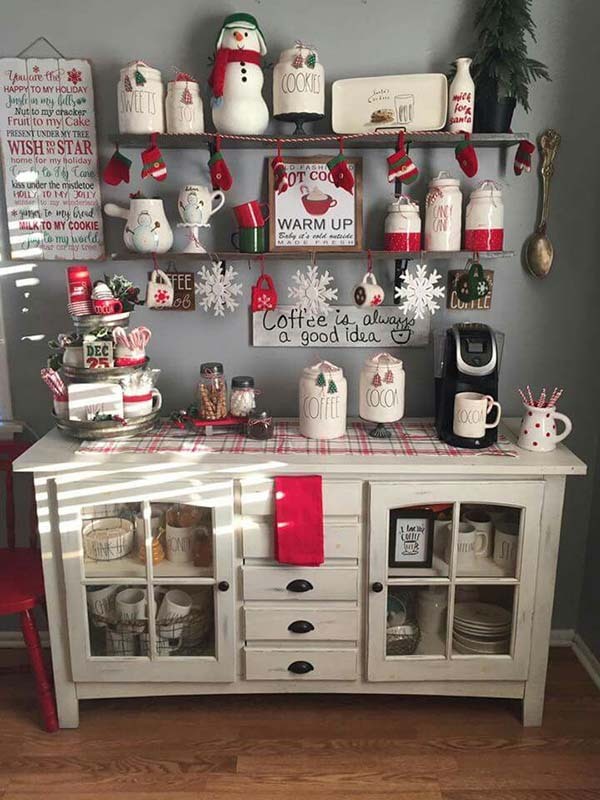 This assemblage can also be a cute accent to your farmhouse Christmas decor this year. My mom taught me how to make serviette snowflakes by my hands when I was 5 years old. I’m also in love with pure white Christmas decorations as they are clean and easy to combine with any interior or color scheme. 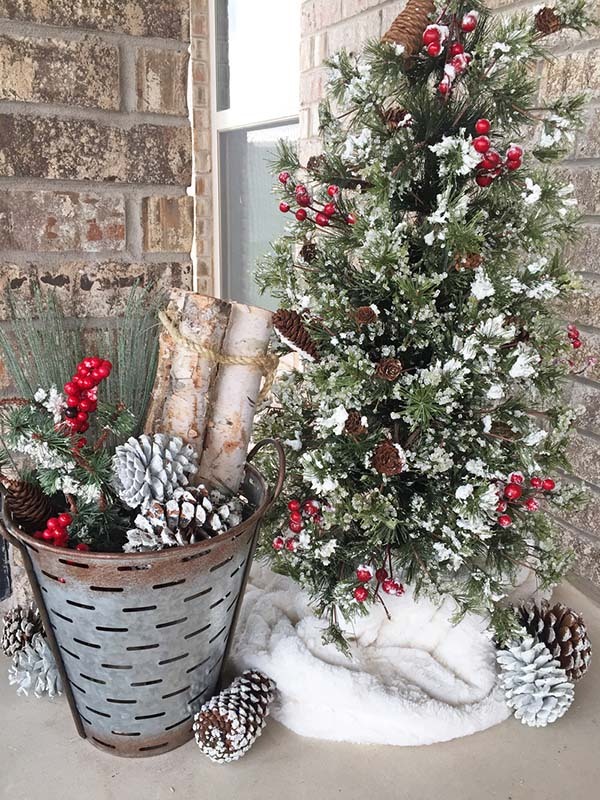 Solid and fabulous, this DIY Christmas wreath is made of evergreen, pinecones, magnolia leaves, cotton, and berries. It will perfectly compliment your farmhouse porch decor. Everyone will agree the wreath is an important piece of the outdoor farmhouse Christmas decorations! It will make your front door dazzling! 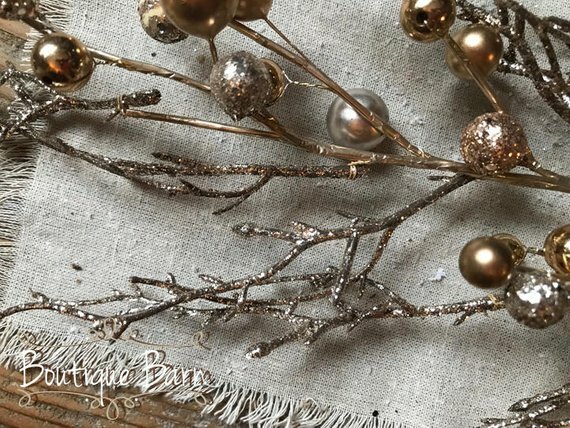 This metallic 33-inch decoration, made of tiny gold and silver glitter balls and sticks, could be the eye-catching final touch to your farmhouse Christmas decor. Let’s get inspired by the earth’s elements to create a chic, rustic holiday dining table set for the family Christmas evening! 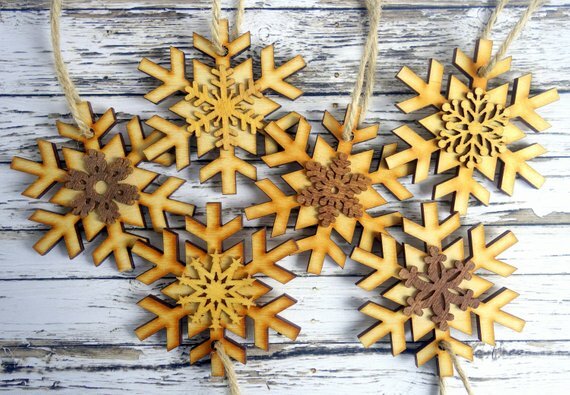 These 6 DIY laser-cut wooden snowflake ornaments could be the ideal rustic Christmas tree decor for you this year! 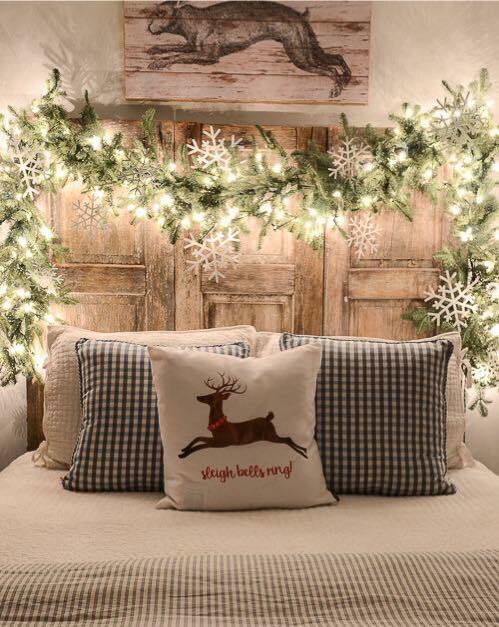 When speaking of Christmas decor, you don’t have to ignore the bedroom space! Pile a bunch of nice cotton-made Christmas cushions to the bed for making the room more cozy and warm. These large J-O-Y wood block letters surely make a strong statement displayed on the mantle or on top of the kitchen cupboard. 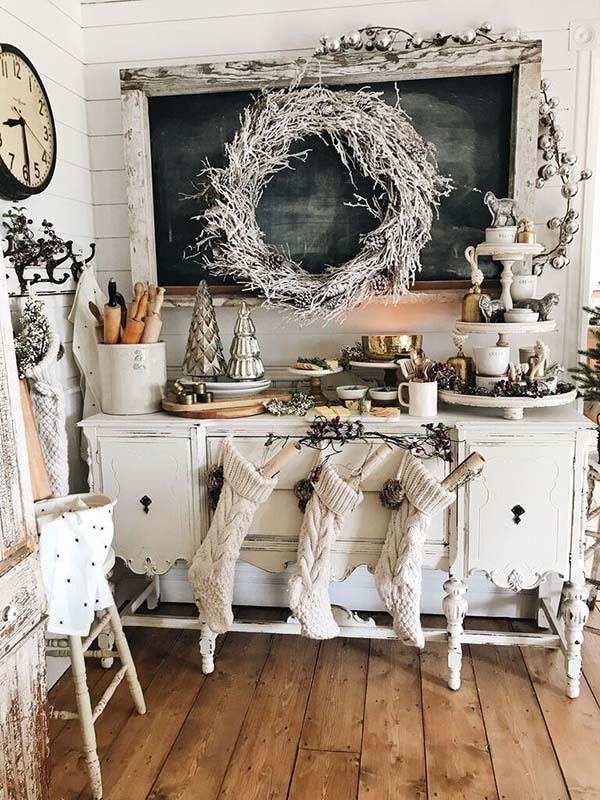 Here is a bundle of charming kitchen farmhouse Christmas decorating ideas you can freely get some inspiration from! A red and white kitchen set never goes out of style. The festive season is coming up so fast. 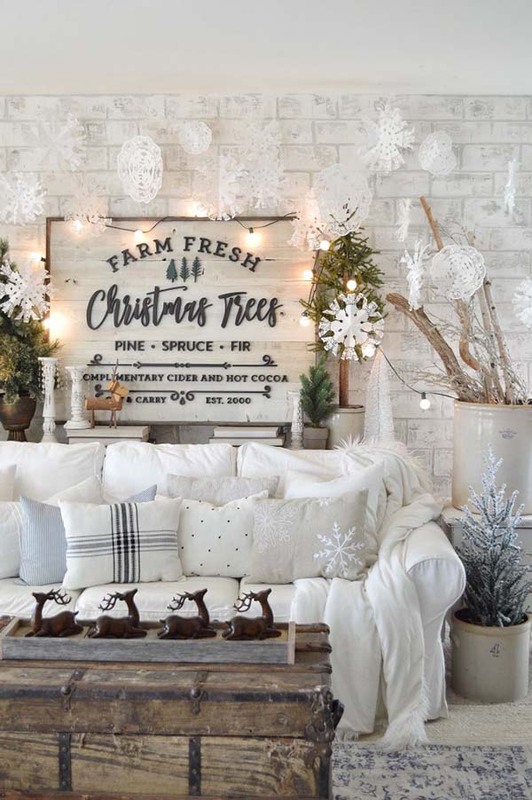 I hope you found some inspiration for every room in your home thanks to my 29 farmhouse Christmas decorating ideas!